Copyright © 1995-2008 by Rosanna L. Hamilton. All rights reserved. The volcanic mountains creating the Hawaiian islands are among the greatest mountain ranges on earth. They rise an average of 4,572 meters (15,000 feet) to reach sea level from their base on the sea floor with the highest (Mauna Loa) climbing an additional 4,170 meters (13,680 feet) above sea level. As shield volcanoes, they are built by thousands of accumulated lava flows growing no more than 3 meters (10 feet) at a time to form a broad, gently sloping, flat domed volcanic cone. The islands progressed from northwest to southeast with the first volcanoes becoming extinct as the activity moved southeast. Some researchers believe the archipelago, or group of islands, originated from the accumulation of basalt piles over a great fissure, with the activity shifting progressively to the south. Another hypothesis suggests the Pacific plate is moving over a fixed "hot spot" in the mantle. Today only two volcanoes are left active, the Mauna Loa and the Kilauea at the southeasternmost end of the chain. After volcanic mountains reach the surface, they are subject to the effects of erosion; unless lava continues to flow, the whole mass could wear away. In the early stages of erosion, a fringing reef will attach to the shore, such as occurred off Waikiki Beach in Honolulu. A fringing reef will eventually become separated from the shore by a lagoon, forming a barrier reef. Eventually erosion or submergence might completely overcome the island and the barrier reef might form an atoll, which is a ring-shaped coral island forming a lagoon. When the top is completely worn away, it leaves a shoal cutting across the volcanic cone several fathoms below sea level, similar to the French Frigate Shoal. Eruptions in the Hawaiian volcanoes are usually preceded by a series of earthquakes which open fissures and allow magma to reach the surface. Initially lava fountains, known as "curtains of fire," hurl streams of lava hundreds of feet into the air from many points along the fissure. Hawaiian flows are considered to issue forth relatively quietly since the lava is quite fluid, and the gases escape readily without the disruption of the lava into ash or cinders. Great floods of lava will then flow down the mountainside. 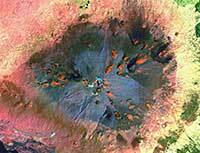 Eruptions have lasted from a few days to ten months, frequently followed in two or three years by a flank eruption. Mauna Loa is considered the "monarch of mountains." It is the largest volcano and the largest single mountain of any kind in the world. It is 97 kilometers (60 miles) long, 48 kilometers (30 miles) wide, and rises about 8,742 meters (28,680 feet) from its base on the sea floor. The slopes of Mauna Loa are no steeper than 12°, with a mere 4° slope near the top. On the summit is an oval shaped caldera called Mokuaweoweo which is 4.8 kilometers (3 miles) long, 2.4 kilometers (1.5 miles) wide, and 183 meters (600 feet) deep. Eruptions usually begin as lava fountains on the floor of Mokuaweoweo and are followed by great volumes of lava, although sometimes eruptions flow without the initial outbreak. Mauna Loa is extremely prolific producing .9 to 4.5 million metric tons (1 to 5 million tons) of lava per hour in the early stages of an eruption. In 1831, three-fifths of a cubic mile was added to its mass. During the period between 1831 to 1950, Mauna Loa averaged an eruption every 3.6 years and was active nearly 6.2% of the time [Press, 1986]. The Kilauea Volcano is located about 3,048 meters (10,000 feet) below the summit of Mauna Loa. It is a shield volcano approximately 80 kilometers (50 miles) long and 22.5 kilometers (14 miles) wide that accumulated along the side of Mauna Loa. The summit of Kilauea is 1,250 meters (4,090 feet) above sea level, 6,096 meters (20,000 feet) above the ocean floor. The summit caldera is 4 kilometers (2.5 miles) long, 3.2 kilometers (2 miles) wide, and about 120 meters (400) feet deep. Near the southwestern edge of the caldera is the "fire pit," known as Halemaumau (House of Everlasting Fire), which has at times contained a lake of boiling lava. The pit is enlarged periodically by steam blasts and collapsing walls. In 1924, it was enlarged from 610 to 1,070 meters (2,000 to 3,500 feet) in diameter and measured 396 meters (1,300 feet) deep. Typical eruptions consist of lava flows forming lava lakes in Halemaumau or elsewhere on the caldera through fissures and rift zones. However, Halemaumau seems to be the principle conduit where lava reaches the surface. The unifying agent among volcanoes is the active ingredient of gas. The primary gas given off in an eruption is water vapor or steam. When water changes from a liquid state to a solid state, the expansion is about one ninth of its volume. When water changes from a liquid state to a gaseous state its volume increases 1,000 times; thus producing the force necessary for a volcanic eruption. Before eruption, water and dissolved gases are confined by the pressure of the overlying rocks, but as the magma rises to the surface the pressure drops and the gases are released. Gas is necessary to move the magma, and magma is the vehicle carrying the gas. As magma is released from the vent, lava flows along Earth's surface and eventually takes one of two contrasting but related forms which Hawaiians have named aa and pahoehoe (pronounced ah ah and pahoyhoy). Pahoehoe is formed as a layer of "skin" covers the underlying liquid lava and the movement of the continued lava flow below begins to wrinkle the surface creating a ropy or billowy appearance. Pahoehoe in Hawaiian means "ropy." Aa is what a barefoot Hawaiian would say while walking on it: "ah . . . ah . . . oh . . . ah" [Press, 1986]. Its sharp, angular, jagged blocks have dangerously sharp edges and spiny projections on a noncontinuous surface. Some flows issue from the vent as pahoehoe and change to aa as they are stirred, cooled, lose gas, and increase in crystallization. Lava does not convert from aa to pahoehoe. 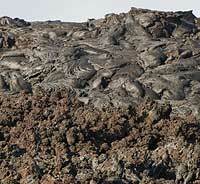 Once a crust has formed on pahoehoe, lava tubes below continue to move the remaining liquid for long periods of time. The size of the tubes range from only a few inches to many feet in diameter. When the source of lava stops, the liquid continues to drain, leaving lava tubes or caves. Spatter cones are steep sided, conical hills built from the spatter of lava fountains. Underwater flows produce pillow lava which are ellipsoidal, sacklike blocks about a meter in dimension budding off of lava tongues or tubes. Lavas can have many features depending on the rate in which they cool. Lava lakes are large volumes of molten lava, usually basaltic, contained in a vent, crater, or broad depression. Scientists use the term to describe both lava lakes that are molten and those that are partly or completely solidified. Lava lakes can form (1) from one or more vents in a crater that erupts enough lava to partially fill the crater; (2) when lava pours into a crater or broad depression and partially fills the crater; and (3) atop a new vent that erupts lava continuously for a period of several weeks or more and slowly builds a crater higher and higher above the surrounding ground. This is a false-color composite image of Mauna Kea Summit, Hawaii. It was constructed from data gathered between 1999 and 2001 by the Enhanced Thematic Mapper plus (ETM+) instrument, flying aboard the Landsat 7 satellite. Hawaii was created by a "hotspot" beneath the ocean floor. Hotspots form in areas where superheated magma in the Earth's mantle breaks through the Earth's crust. Over the course of millions of years, the Pacific Tectonic Plate has slowly moved over this hotspot to form the entire Hawaiian Island archipelago. A cinder cone is a steep, conical hill of volcanic fragments that accumulate around and downwind from a vent. The rock fragments, often called cinders or scoria, are glassy and contain numerous gas bubbles "frozen" into place as magma exploded into the air and then cooled quickly. Cinder cones range in size from tens to hundreds of meters tall. Many of the images and captions were taken from the Mouginis-Mark slide set. Bullard, Fred M. Volcanoes. University of Texas Press Austin & London, 1976. Press, Frank and Raymond Siever. Earth. W. H. Freeman and Company, New York, 4th edition, 1986. Mouginis-Mark, Peter. Volcanic Features of Hawaii and Other Worlds. Lunar and Planetary Institute, slide set.